Page Building, Suite 309* houses our new West Campus office space! It can be found by going in the main doors leading to Page Auditorium, heading through the glass Theater Studies door on the right, and taking the stairs to the third floor. In Page 309, you can find the offices of Fr. Michael Martin, Fr. Brad Heckathorne, Evan Wescott, Emma Miller, Ruth Anne Kennedy, Michelle Sutton, and Michelle Naehring. *We are working with Duke to improve accessibility in this building. If accessibility to the third floor is problematic for you and you need to meet with DCC staff, please let us know and we will find an alternative location to meet with you. We are happy to accommodate your needs! Goodson Chapel, the worship space for 11:00 AM Sunday Mass and Wednesday night Holy Hour during the academic year, can be found in the Duke Divinity School. The Divinity School is located to the North of Duke Chapel. Duke Chapel is our worship space for 9:00 PM Sunday Mass. Many of our activities are held at the Falcone-Arena House, located across from East Campus at the corner of Buchanan Boulevard and Trinity Avenue. 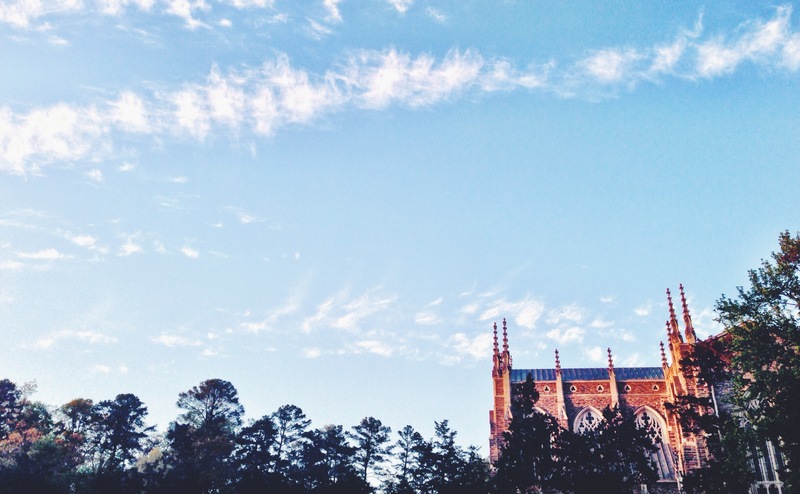 Your DukeCard provides access to the house from 8 AM until 10 PM, for prayer, study, quiet, gathering with friends, food, meetings, or whatever renews your spirit. The offices of Catherine Preston and Andrew Witchger are also located here.